You see, I love macaroni and cheese. It's my favorite food and I can eat it every day. oo Island is full of fun, happiness and sunshine. The island exudes it! Roo Island is a small island located off the coast of Neopia Central. 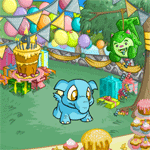 Once you step foot on the island, you are greeted with the smiling faces of bouncing Blumaroos! 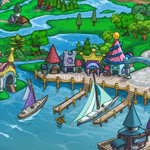 Along the boardwalk, you can shop for souvenirs, play games exclusive to Roo Island, and learn how to draw a Blumaroo! There are plenty of things to do to keep yourself busy! Roo Island is home to some iconic landmarks in Neopia. Here you will find the ever-fun, ever-exciting Merry-Go-Round! Neopians of all ages love visiting the island to take a spin on the Merry-Go-Round; it never gets old! Here, you will also be able to play Dice-A-Roo and Blumaroll. Dice-A-Roo is the most popular game played on the island because no two games are the same. These magical dice bring prizes and Neopoints, unless you roll a skull and lose the game. However, if you are so lucky as to win the jackpot, you take home a hefty prize of Neopoints AND an exclusive avatar. The King loved this game so much, and it is the reason why the Blumaroos are always so cheery. Buying exclusive items that exemplify the culture of Roo Island will make your Neohome more welcoming and fun; it will also keep your guests, and you, in a great mood! Hello, fellow Neopians! Today I wanted to talk with you about one of my favorite games: Hasee Bounce. There’s just something about those little orange and purple fellows that makes me smile. However, not everyone knows the best way to bounce Hasees for fun and profit. I was shocked to learn that some Neopians haven’t tried this game at all – it’s definitely something I’d recommend everyone to try! If you want to learn, then read on. Birthday Shop Is Closing Soon!